2000% cost savings comes with variable micro litre to milli litre accuracy! 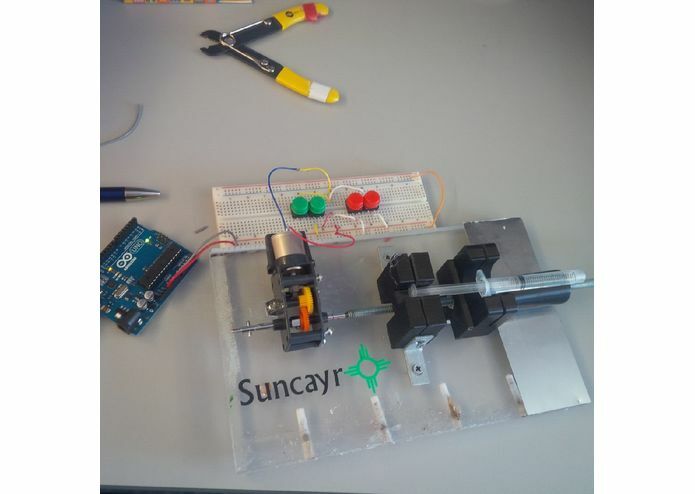 We needed a syringe pump to run our startup Suncayr. We're a group of nanotechnology engineers making a colour changing marker that you can draw on your skin that will let you know when to re-apply sunscreen. We were left with the gloomy outlook of having to purchase a 500$ syringe pump, when all we want to do is use the money we've been able to raise from winning pitch and product competitions towards valuable research. We created a 25$ syringe pump that is scalable and accurate. It can pump on the milli litre range or micro litre range. We can further integrate the Arduino with the rest of the equipment in our lab to fully automate our synthesis procedures - this is something that is never done in a traditional research lab, but will greatly improve Suncayr's efficiency in the future.